Dishwasher shows LC code and needs to be reset. My Samsung dishwasher is flashing the error code LC. During a wash load of dishes the dishwasher stopped and began flashing LC. Now the dishwasher is not usable. I have tried to reset the dishwasher by pressing the buttons on the control panel but it has not cleared the code. I do not see any water leak under the dishwasher. I would like to know what this code means and how do I fix and clear the code? The dishwasher is 8 months old and is model number DW7000. Quick answer: The LC flashing on your Samsung dishwasher indicates that the leak sensor in the dishwasher detects a water leak or moisture. To clear the error code LC, simply remove power to the dishwasher for 15 minutes. This should reset the dishwasher and clear the error code. If the error code does not clear, there may be a LEAK SENSOR FAULT or the dishwasher has an actual WATER LEAK. NOTE: When the dishwasher bottom pan is damp or has moisture (does NOT have a true water leak) the dishwasher thinks there is a water leak thus causing multiple issues concerning the code LC or LE. First, find out if your Samsung dishwasher is actually leaking water. Check under the dishwasher. If water is present, then the dishwasher is most likely leaking water and the code LC or LE is correctly displayed. Do not overfill the dishwasher with detergent. If the dishwasher dispenser is overfilled with detergent or has excess detergent, the LC code can occur. Dishwasher was recently moved or installed? The dishwasher may have some moisture or water that has gotten on the sensor, give the sensor time to dry to clear the LC code. Dishwasher recently connected to garbage disposal? A newly installed garbage disposal that is attached to the dishwasher may be the cause of the problem if the cap on the garbage disposal is not removed. Inspect to be sure the cap is removed to clear the LC code. Dishwasher keeps flashing LC code? Unplugging the dishwasher and waiting 15 min did not reset the code… If the above solutions do not clear the LC or LE code on your Samsung dishwasher, you can try to adjust the leak sensor within the dishwasher. Unplug the dishwasher from power. Remove screws holding dishwasher to cabinet. Slide the dishwasher out of cabinet to gain access. Dry any moisture or water in the dishwasher. Relocate the leak sensor up a few inches higher. Check ALL water lines to be sure they are secure and not leaking. Install the bottom square panel. Slide the dishwasher back into place. Install screws to secure dishwasher. Test dishwasher to check that the error code LC or LE is fixed/cleared. 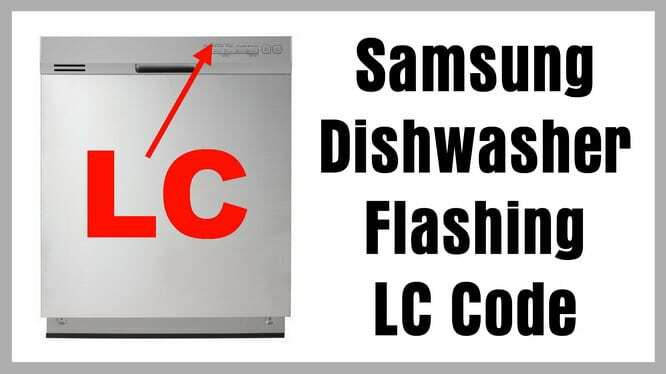 If your Samsung dishwasher has the LC or LE code and the above information did not fix your problem, please leave a detailed question about your issue. Please tell us the model number of your dishwasher (ex. 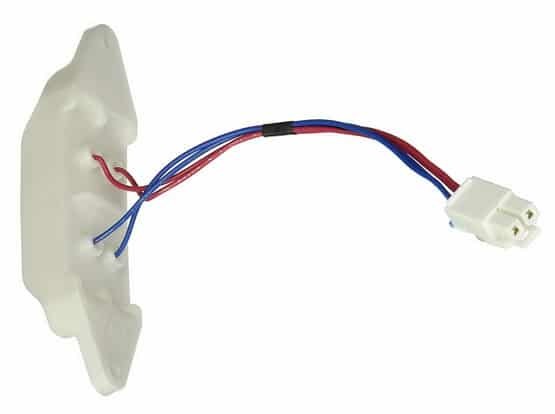 DW80K5050US, DW7000KM) and we will complete the troubleshooting to fix your dishwasher. I had the LC code display on my dishwasher too. Resetting the power for 15 minutes did not work, so I pulled the dishwasher out of the cabinet and used nitrogen to clear the drain lines, which were very much blocked causing water to saturate the leak sensor. Works like a charm! Previous post: Refrigerator Has NO Power – How To Troubleshoot? Next post: What Type Of Screws Do I Need To Attach A Second Computer Monitor?